A to-scale schematic of the quadruple stellar system overlayed for comparison with a diagram of the solar system's planetary orbits. AUSTIN, Texas — A quartet of stars has beendiscovered in an intimate cosmic dance, swirling around each other within aregion about the same as Jupiter's orbit around the sun. Astronomerssay a gaseous disk might have once engulfed and pushed the stars into theirtight orbits. Though bright,the stellar system was thought to be a single star dubbed BD -22°5866. Now,research presented here today at a meeting of the American Astronomical Societyreveals the pinpoint of light is a rare system of four closely orbiting stars.The group is located about 166 light-years from the sun. In our sky, they arejust south of the constellation Aquarius. Each of thestars is about half as massive as the sun and older than 500 million years. Thesun, by comparison, is 4.6 billion years old. Since moststars form as part of a multiple-starsystem, the new findings could have implications for understanding theevolution of stars. EvgenyaShkolnik of the University of Hawaii's Institute for Astronomy and NASAAstrobiology Institute and colleagues spotted the foursome while surveyinghundreds of nearby low-mass stars with the Keck I telescope and theCanada-France-Hawaii telescope, both on the summit of Mauna Kea. At the timeof the observations, two of the stars were orbiting each other at 300,000 mph(483,000 kilometers per hour), taking under five days to complete anorbit. The other couple had an orbit speed of 120,000 miles per hour (193,000kilometers per hour) and takes about 55 days for a complete jaunt around theircommon gravitational midpoint in space. 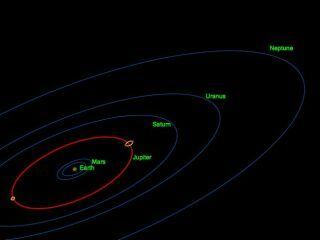 The firstpair has an orbit radius of at most .06 astronomical units (AU), where one AUis the average distance between Earth and the sun. The second pair has amaximum radius of .26 AU. The twopairs also promenade each other in less than nine years with a maximum radiusof just 5.8 AU. Jupiter, to compare, is 5.2 AU from the sun. Theresearchers say that fewer than 1 in 2,000 stars observed might be involved insuch intimatelybound systems. "Theextraordinarily tight configuration of this stellar system tells us that theremay have been a single gaseous disk that forced them into such small orbitswithin the first 100,000 years of their evolution," Shkolnik said,"as the stars could not have formed so close to one another." In fact,the spin energy of the more rapidly rotating pair, mixed with the gravitationalinteraction between the two pairs, has pushed the other pair farther away overthe years. "Atone point early in its history, it was even closer than we see now,"Shkolnik told SPACE.com. Theresearch has been submitted to the Astrophysical Journal Letters.